Some see it as a privilege, others, a curse. I see it as a book. A book that sometime I really really want but mostly just a book. An ordinary, perhaps sort of early, book. Those books carry a lot of weight. Mainly because it has a stigma of prestige (which really isn’t always true). You are a Big Blogger. Publishers like Big Bloggers for marketing purposes. They send you Incredibly Coveted Book six whole months before it releases, and the bookish world is in awe. The subject of ARC envy has already been discussed, in great detail and in great depth so I’d rather just leave that specific nest alone, because I’m shining light on something else. We all love to read. We all love to love reading. But there are books that we honestly don’t give any fucks to finish, and sometimes those books are ARCs. This usually makes us unsure of what to do. Do we discontinue? Will the publisher get mad? Or rather, they shouldn’t. Maybe a publisher is extra sensitive. Maybe they’re just being dicks. But they really should not get mad if a reviewer DNFs a book because they didn’t like it. Isn’t that the whole point of a review? To give their honest to goodness, unbiased and uncoloured opinion of a story? I think publishers already acknowledge the fact that yes, we are all human beans (not beings, beans) and won’t love everything we get. We request the books in hopes of liking it, but there’s never a guarantee. I am a firm believer in that this an inherent risk publishers take, and that in sending out those arcs anyway, accept that risk in getting a measly DNF. Of course, promo tours are another thing. Promo tours are usually made solely for sprinkling all the golden fairy dust over a book and making it as shiny and loud as possible. All the five four four and a half ratings get showcased and you’re just covered in glitter because this book is awesome promo everywhere. I understand if a publisher wants you to refrain from sticking a big red I DID NOT LIKE in the middle of their tour. 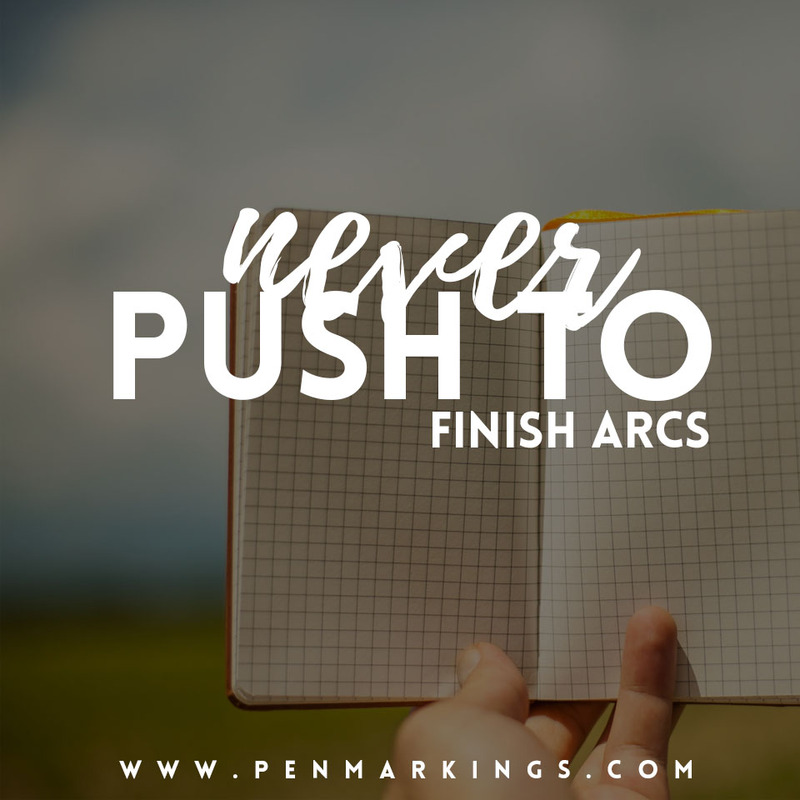 If you don’t like an ARC, dump it! Life is too short for this. Say you didn’t like it, detail why, and move on. what do you guys think about this? do we owe it to the authors to finish it, even though we don’t want to? or is that a risk they accept when sending it out to us? I used to feel BIG anxiety over finishing/finding time to read alllll the ARCs that were sent to me…. but then I realized something– I am not getting paid. I did not sign a contract. I try very hard to read alllll the books, but sometimes I read slow. Sometimes life gets in the way. And I sometimes I am just a bad time manager. It doesn’t mean that I don’t want to read the book. I SO DO!! I know that publishers expect that they sent you a free book, they want the review. I totally get that. But I’m only human. I also try to Bookstagram/talk about books I’ve gotten on my blog, so at least some of the ARCs at least get some air time even if I don’t get to them when I wanted to. AND if you want to DNF, you DNF. It’s not worth stressing out over! YES! We do this to help the publisher on our own accord, and it’s really nice to get a free book but sometimes we won’t like it, and that’s an unchangeable fact. I like your policy of bookstagramming them, even if you don’t end up reading them. Publicity is still publicity, yeah? Totally! I used to think that you couldn’t tell a publisher/tour host if you didn’t finish the ARC, if you didn’t like it, why you had to DNF, etc. But recently I realised you could, and ahhh it was just so liberating. Instead of forcing myself to finish ARCs and kind of hating them – I’m now just doing what I want to do, which is the whole purpose of blogging for me! 🙂 Great post, Claudia!